1000 kilometres (600 miles) from the nearest civilization, situated midway between continental Norway and the North Pole, lies Svalbard. This region is international territory, demilitarized and a free economic zone. It does not require a visa, but it is still governed by Norway. 42 different nationalities is represented here, but Polar bears still outnumber people. 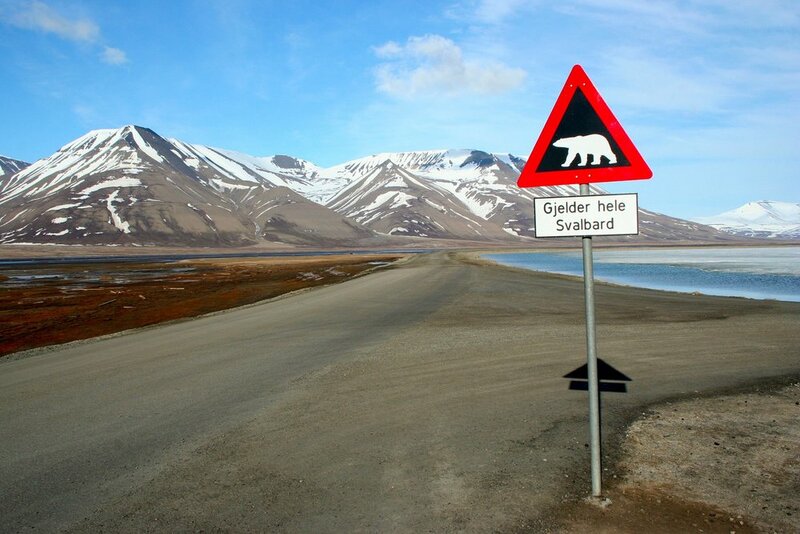 The majestic white bear might be the biggest tourist attraction in Svalbard. And they are very much protected. You are required to bring appropriate equipment to scare them off and you are advised to also bring along firearm for use as a last resort. The likelihood of being attacked is very rare, there´s only 2-3 yearly incidents worldwide. But within the last 40 years five people have been killed in Svalbard. So if you bump into a hungry bear, you need to be prepared. Keep in mind that shooting a Polar bear will be thoroughly investigated by police. An animal you don´t have to fear, is the Svalbard reindeer. These are peaceful animals and it´s not a rare sight to see them wandering through Longyearbyen, the largest settlement and administrative center in Svalbard. Along with research, tourism has become an increasingly important industry in Longyearbyen recent years, and there´s a bunch of hotels, inns and restaurants to pick from. An impressive variety of local food includes arctic tapas, bearded seal, common eider eggs and locally produced herbs. But most of Svalbard is glaciers, mountains and fjords and has few signs of human intervention. Still the archipelago has a significantly warmer climate than other areas at the same latitude. January averages at -16 to -12 °C (3 to 10 °F) and average summer temperature is at 4 to 6 °C (39 to 43 °F). After the sun sets on October 25 it doesn´t show again until the first sunrise February 16. By February 28 it is up for as much as seven hours at a time. But the official return of the sun is March 8. To welcome the sun back, everybody gathers by the old hospital steps downtown at 12.15 and wait for the first rays to arrive. If you choose to travel this far north, you should not miss a chance of observing some of the fascinating species that has adapted to these extreme conditions. The Arctic fox, the Rock ptarmigan and the Arctic puffin can all be seen here in winter, along with the Polar bear and the Svalbard reindeer. Depending on what time of year you visit, a number of marine mammals live out here, including whales, dolphins, seals and walruses. The region also has a rich birdlife, although most birds migrate south for the winter. Species that survive here aren´t many, but they are often highly abundant. So your chances of seeing what you came to see, are pretty good. You can´t get much further north than than this! SAS and Norwegian offer daily flights from Oslo.